Boston cream pie; photo by Jess on Flickr (noncommercial use permitted with attribution / no derivative works). 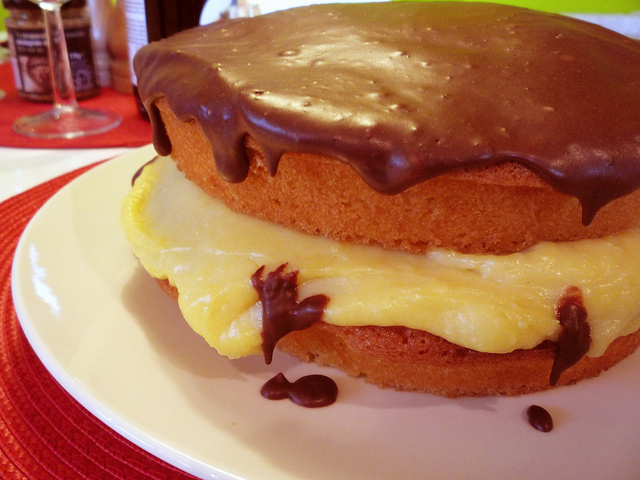 The traditional Boston cream pie is a yellow cake filled with custard or cream and topped with chocolate glaze. The recipe for Boston cream "pie" was created in the 19th century, when the same pans were used to bake cakes and pies. In 2003 Massachusetts also recognized the Boston cream donut as the official state donut. Bay staters have several more official food symbols; a state cookie, muffin, berry, bean, and beverage.